Native to Europe and Asia, common mullein (Verbascum thapsus) is part of the figwort or Scrophulariaceae family and is an erect, invasive herb. Common mullein invades and spreads rampantly throughout open areas in forests and meadows, growing aggressively and overtaking most other native grasses, herbs, shrubs and other plants. Because common mullein is also a vigorous seed producer, this weed can spread quickly and be difficult to get rid of completely. There are three main strategies for controlling common mullein weeds: manual or mechanical removal, biological control, and chemical control. Hand pull the common mullein plants, preferably before the plant sets its seeds. The common mullein plants should pull up easily because of their shallow taproots. Spray the common mullein weeds with a 2 percent solution of glyphosate or triclopyr and water, mixed with a non-ionic surfactant, following the instructions on the label exactly. 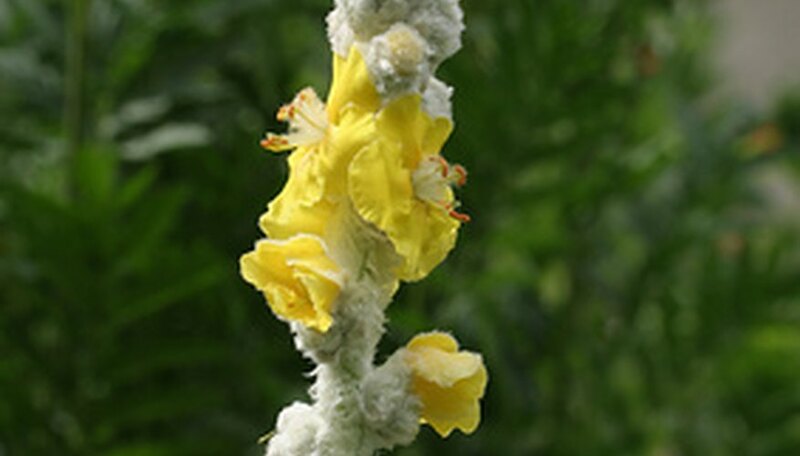 Pour the mixture into a garden tank sprayer and spray the mullein to cover the leaves thoroughly. Release the European curculionid weevil (Gymnaetron tetrum) or the mullein moth (Cucullia verbasci) around the common mullein plants. These two insects can get rid of the common mullein by destroying the seeds and feeding on the plants. Reduce the chance of common mullein seed germination by planting the bare ground nearby mullein plants with vigorous native grasses or other plants that germinate readily. This will help to choke out the mullein seeds and decrease the chances that the mullein seeds will germinate successfully. If you have only a small number of common mullein plants, hand pulling them is the easiest and safest solution. Employ the use of herbicides or biological controls if you have a large area that's infested with mullein weeds. Use triclopyr if you have desirable plants near or surrounding the common mullein, because this is a selective herbicide that kills broadleaf plants. You can use glyphosate only if you don't have other plants nearby, because glyphosate is a non-selective herbicide that will kill any plants that it comes into contact with. Be extra careful when you're manually removing the common mullein plants if they have flowers or seed capsules on them. If the seeds or blooms are present on the weed plants, remove these first and place them in sealed bags to dispose of them before hand pulling the common mullein. Always wear protective glasses and gloves when you're handling chemicals like herbicides. Use caution and consult your local agricultural extension service when releasing biological control insects, because after you release them into the natural environment they're impossible to control.